When I was in college, I ate a lot of things that I thought were amazing that I can’t eat today, because gross. On this list: chicken fettuccine alfredo from a box (every.thing was included, people), a “milkshake” that involved fat-free, sugar-free chocolate pudding mix, skim milk, and a lot of ice cubes, and turkey bacon that I cooked in the microwave. (For the record, I also ate a lot of things that I can’t eat today because of metabolism issues, such as midnight $5 chicken parmesan pizzas, lots and lots of cookie dough, and two Panera cinnamon crunch bagels + an icy mocha…as a snack.) My philosophy of food has changed a lot since those days, and I would rather occasionally eat the “real thing” than fake milkshakes and turkey bacon. Once every month or two, I buy a package of bacon and when I’m smart and I love myself, I cook it all at once in the oven. That way, I don’t end up with any of these issues: daily bacon grease spatters on my stove, smelling bacon every time I walk in the house for a week, and accidentally letting the last couple of slices go bad in the fridge. That never happens with cooked bacon, I can assure you! You can also freeze cooked bacon, but we don’t seem to have a problem going through a pound over a few days. Potato soup, a breakfast sandwich or two, a cold bacon snack standing in front of the fridge, and it’s gone. 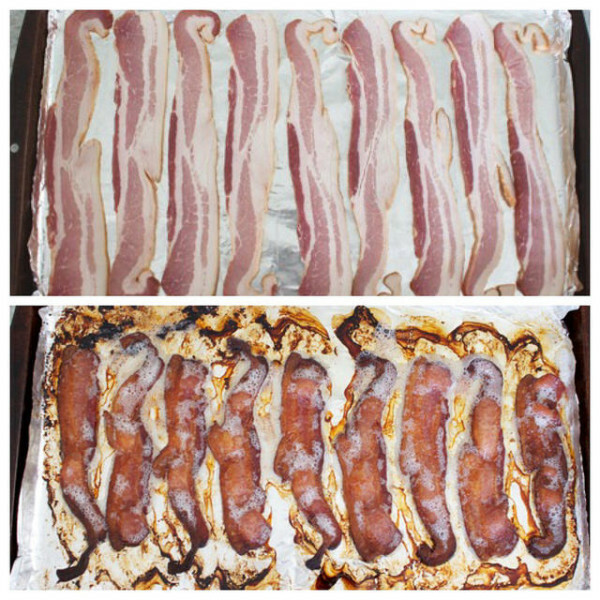 To roast bacon in the oven, please use a nice big piece of foil to cover your whole pan, including the edges. I like this heavy duty foil that’s extra wide for this purpose, even though it doesn’t fit in my kitchen drawers and has to live in the laundry room. This makes clean-up a breeze! Depending on the thickness of the bacon you’re using and how crispy you like it, the roasting process could take anywhere from about 12 to about 20 minutes. This bacon is thick-cut, so I roasted it for 20 minutes. I love being able to cook it all at once, with the mess contained to the foil. Plus, it cooks really evenly and stays nice and flat. I also like to pour the grease from the foil into a little container and keep it in the fridge for cooking eggs, these green beans, breakfast potatoes, chicken…it’s just a good thing to have around! Good luck trying to fend off family members so you actually have leftovers. Stay tuned for one of the best uses for your lovely pile of bacon! And while you’ve got the grease on the foil…may I recommend these life-changing super crispy roasted potatoes? 1 package of bacon – I used a thick-cut kind this time, which makes for a chewier finished product. 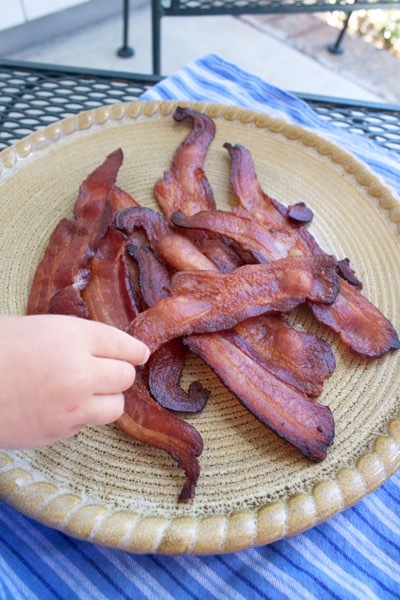 If you want a crispier/snappier bacon, choose something thin-cut. Preheat the oven to 400. 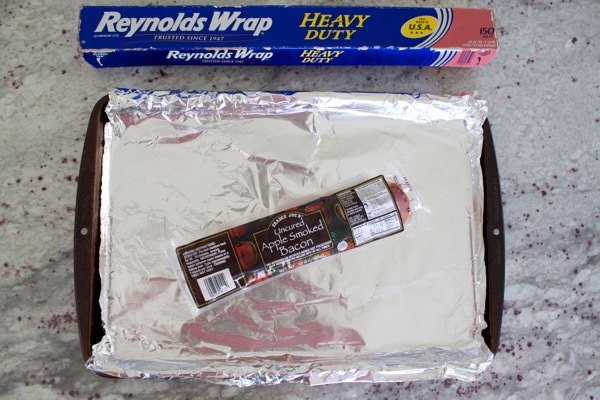 Line a rimmed baking sheet with foil so that it goes up over the edges, too. Lay out the slices of bacon so there is a little room in between each slice. For thin-cut bacon, roast for 5-6 minutes, then rotate the pan front to back and continue to roast for 5-6 minutes more or until it reaches desired crispness. For thick-cut bacon, roast 8-10 minutes, then rotate the pan front to back and continue to roast for 6-10 minutes more. Remove the bacon from the pan and let drain on paper towels. Serve immediately, or refrigerate or freeze to use later. 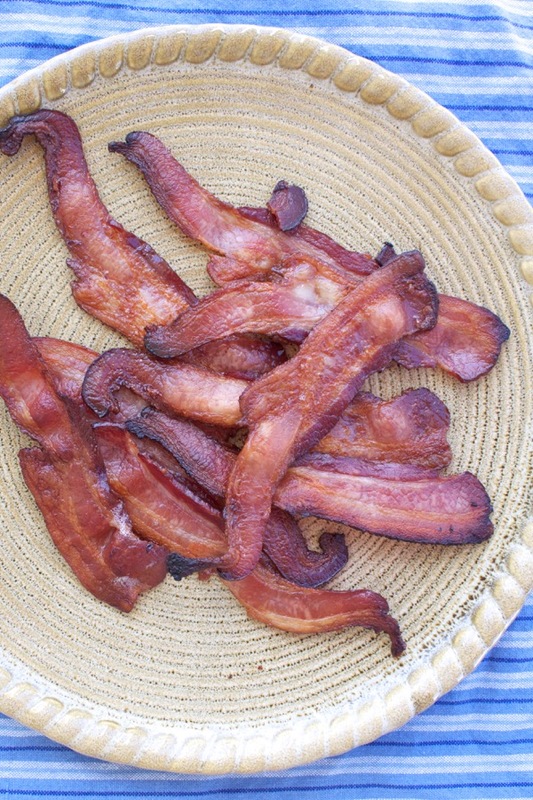 To reheat, place bacon on foil and toast it in the toaster oven until hot. If you want, pour the grease from the foil into a container and refrigerate for later use. Must. Have. Plate. Of. Bacon. Right? Bacon delivery. It could be a thing. I ATE THAT TURKEY BACON IN THE MICROWAVE TOO (see how I was really excited about it?). It was super thin and super crunchy and often had black burned slots from I’m assuming hot spots in the uneven microwave heat. ???????????? I even had a fancy zigzag microwave bacon tray that I used. So awesome. #notreally #neveragain. Give me all the regular full fat bacon. Sometimes I think I could eat a whole pound by myself. So good. And I like the oven trick too. Bahaha, glad I wasn’t alone in my turkey bacon consumption! This is the kind of thing that makes me wonder if I’m going to look back at things I eat now and be like…whhyyyy? Just did this. Favorite part is not having to wipe grease up on the stove! High fives all around. Woohoo! Glad you liked it, Elizabeth! Yes! I love making bacon in the oven! BUT I’ve never saved the grease before to use in other cooking. The only time I ever make bacon on the stove is when I want some eggs fried in bacon grease. So smart to save the grease! My great-aunt was famous for using a bit of bacon grease in her peanut butter cookies…they were amazing. Oh, wow, Erin! I think she and I would get along juuust fine. Genius!